Hi guys, since alarm's battery recently has gone leaving me with error on vcds I was looking to replace siren. Considering a new part will cost a lof of money I started to check If could be possibile to replace the nimh battery only with a smaller amount of money. As far as I learned on forums problems with those siren's battery are not so uncommon on VW, Audi, Skoda. Is there anyone here who replaced battery by himself successfully? Last edited by Franciswat on Wed Nov 07, 2018 8:51 am, edited 1 time in total. Have you Googled Varta 2X3V150H batteries? I did and there are a few pictures of VW Group siren boxes open, I've read about on either VW Passat forums or Audi forums, and yes people have been replacing their failed alarm batteries, depending on where the siren box is located, some people have just bought a battery of the correct voltage and same or capacity and if it was the wrong size, bought a plastic box to seal it into and wired it to the original siren box. I'd think if you Googled this topic you would find many hits and help, I've owned 2 VWs in the past and kept them until they were 13 years old, but never had any alarm box battery problems. Edit, sorry you have done this and found these pictures! Another Edit:- I have done what the poster on the A2OC forum did - not on a car, but with other electrical equipment, ie bought as close as I could and maybe taped or glued them together and used suitable tinned copper wire to connect them to the PCB. Well yes I did it... I know that you said I just asked if anyone did It on this forum. Personally I'd doubt if anyone has done this, so this is your chance to make up a "this is how to replace your alarm siren box back up battery"? Finally i disassembled the alam using a cutter to separate the 2 sides being careful to not damage the interior components. Even if battery exterior conditions are good voltmeter confirms that It has no charge. I've ordered a new battery and will keep you updated. Last edited by Franciswat on Thu Nov 08, 2018 11:41 pm, edited 1 time in total. Where did you find this alarm siren box located in your car, and maybe try soldering a couple of long leads onto the terminals to see if that battery is being charged when the engine is running, ie is the voltage getting increased when the engine is running. May be possible to power on the unit using an external 12v source to execute this test? I'm not an electrician so this is probably wrong but I post it anyway so maybe someone can correct me! 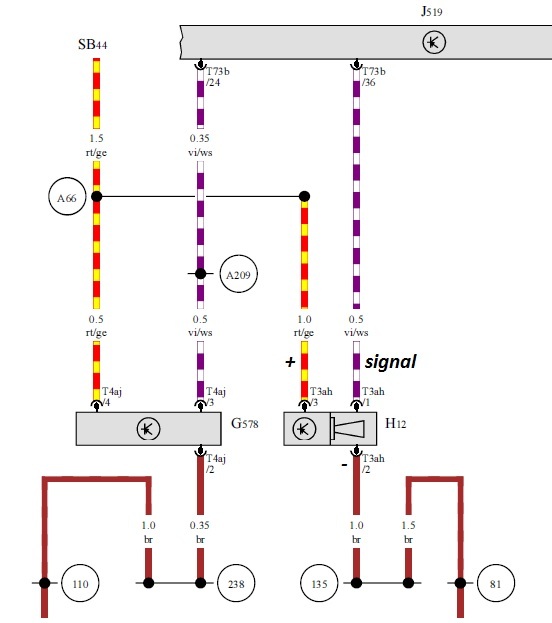 Well there are 3 pins on the connector for this box, logically it needs +12V, 0V and a trigger input to switch the siren on to sound, so maybe that circuit diagram is okay. Where in the car did you locate this box? I post an image to show you. Alarm position is much uncomfortable to reach (wipers have to be removed). After original batteries check I noticed they are not linked in series themselves (you can separate them) but through the circuit board to reach 7,2v. Very good, thanks for that information, I suppose that there are only 2 positions that the alarm siren box could be, either where you found it or behind the trim in the boot/hatch area at the other end of the car. 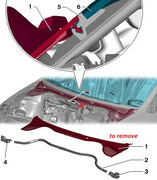 Removing that water deflector shield, did you use an online guide which I think suggested starting at each side of the car and ease it out - or what else did you need to do, and was it quite difficult to remove? I'll add these picture to a folder I have just in case I need to carry out this repair in the future! On the topic of these batteries not being connected together, it must be due to the fact that that specific "2X" battery pack is only used in situations like this. I think if you were doing this again, it might be better/easier to cut the long leads as high up as you can and leave them soldered into the PCB, then hold the 2 batteries down and maybe glue them to the PCB after cutting their contact leads a bit shorter, then solder the original leads onto the ends of these batteries - that was just a though after seeing what you have done. Hello I'm back with news! I followed elsa manuals and used proper tools to extract wipers! I will post you pictures next time if you need! So the good new is that new batteries arrived and they fit perfectly the board! I soldered them, voltages were good and everything fine! The bad new is that one of the 2 batteries inexplicably died after few days I left alarm on my table waiting to put it in my car. I'll get a new battery an will replace it but it will take time to get it..
Hi again, thanks for that update, good to know that you have managed to sort that issue, pity one battery is not so good, though I wonder how long these boxes can "stay alive" if their batteries are fully charged and then the alarm assembly is left disconnected from the car. Maybe that second battery was not charged up fully? Anyway, after reading about an issue someone is having with their SEAT Ibiza's alarm, one question for you:- what happened or was happening with your car that made you need to start investigating this alarm siren box please? Maybe that second battery was not charged up fully? When batteries arrived I checked them both and voltages were good (but voltage could be misleading If battery is not connected to the circuit). I do not think there's something wrong with the board or both batteries should be dead. what happened or was happening with your car that made you need to start investigating this alarm siren box please? Autoscan reports an error like the one below which according to Ross-Tech website means you need to check the alarm. Ciclo gave me confirm of that here viewtopic.php?f=56&t=70398&start=105#p543126. Thanks again for that info, I was just asking the question as to how you knew you had an issue with the alarm horn box as a SEAT Ibiza Cupra owner on another forum has a problem that the siren starts sounding when he is driving, and often (maybe) after he has locked the car up and walked away, the hazards start flashing, but the siren does not sound! I suggested that he needed to get that car scanned to see what if any fault codes have been logged as I thought that it might just be possible that the alarm box batteries have died and the car systems are warning him about that, ie while the engine is running and forcing the voltage up enough to sound the siren while the engine is running, but not enough to sound the alarm when the engine has stopped - or maybe that car has more than one fault. I'm sure that SEAT Ibiza Cupra will "love" me if he finds the alarm box batteries need replaced and after that another fault is forcing the alarm on when the car is parked up? I had forgotten that you had found this fault during scanning your car. Going back to your new problem with only one battery, if both batteries are connected to the same point on the PCB, if battery "went flat" it would drag the other battery down as well - no? One other possibility being that each battery is connected to a different part of the PCB and it is that part/function of the PCB that has flattened that single battery, for instance, if the second battery is being used to power the siren, it would remain okay as the siren was not being operated, I still think that it could be down to what I've suggested plus the fact that batteries are not always fully charged when sold and that box is not connected to a recharging source. The batteries may be connected in series on the the pcb. But there could be a tapping off that to power some of the chips on the board (same fault occurred with Makita 18v tool batteries) so they could of killed the battery in no time as they have very small capacity.